The three-time world champion, Ilya Nikulin, speaks about his role as the national team captain, why the team needs NHL players and what kind of father Ovechkin would make in the future. Izvestia: This time, head coach of the Russian national ice hockey team, Zinetula Bilyaletdinov, summoned only the tried and true players – Ovechkin, Radulov, Malkin, Datsyuk and Kovalchuk. Why so few of them? Did the last Euro Hockey Tour show that rookies were not ready to play for the national team? Ilya Nikulin: No, I don’t think that’s the case. On the contrary, the Finnish Euro Hockey Tour showed that new players are ready to play. I believe that coaches will keep testing various players, trying new combinations and discovering new talents. 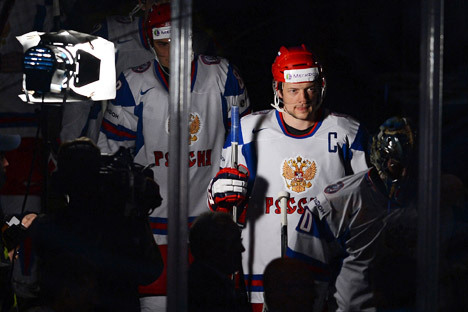 Understandably, the Russian NHL stars don’t need any additional casting. I guess they have been invited for the fans rather than for any tests. This Euro Hockey Tour is taking place in Moscow, and many fans would like to see Malkin, Kovalchuk, Ovechkin and Datsyuk. Izvestia: Do you think the first line will be formed exclusively of our NHL stars? I.N. : I haven’t thought about it. I don’t think we should distinguish the players on the basis of leagues. They all play in the KHL now, and they are playing well. What we must do now is to team up for the tournament, and the way the lines are formed doesn’t really matter. Izvestia: They say the lockout may be over any day now. How will the departure of the NHL stars affect the KHL? I.N. : I’m not really interested in the lockout situation and how well the talks are going. We will only be able to say how much the KHL will suffer once the lockout is over. Until there is a decision, we shouldn’t be talking about it at all. RBTH: You’re one of the best players in the league, and you play for the national team on a regular basis. Why hasn’t the NHL paid any attention to you? I.N. : Where do you get that idea? They did invite me, but there were circumstances that prevented me from leaving. I have a contract with Ak Bars Kazan and it suits me perfectly. Izvestia: Why haven’t they invited your clubmate Aleksey Morozov? Many experts consider him to be your main competitor for captainship. I.N. : You should ask the coaches. I don’t know why Aleksey hasn’t been invited; there is no rivalry between us. When a player is invited to play for the national team, he couldn’t care less about being captain. It is a great honor to play for the country. Izvestia: Which team is Russia’s main opponent? I.N. : All three teams will be strong competitors; they will bring the best players to Moscow. It’s hard to make forecasts, but we only need victory. Izvestia: Ahead of the game against Sweden, what are your chances? Are you in good shape? I.N. : I think I am. Morale is very high, because Ak Bars has not only won but climbed to the top spot in the conference. Winning the cup is our only goal. We need this victory. Izvestia: Will your family be there to support you during the Channel One Cup? I.N. : We haven’t decided yet, but I think my wife and son will come to Moscow. Izvestia: Would you like your son to follow in your footsteps? I.N. : Naturally. He is interested in ice hockey because he wonders what his dad does. If he wants very badly to become a hockey player, I’ll sign him up with a club. It is too early to make plans though: he’s only three. But he keeps asking me to take him to a rink. He always watches away matches on TV and comes to support me during home games – he is my greatest fan. Izvestia: Does Alex Ovechkin (his godfather) handle his duties well? Would he make a good dad? I.N. : Yes, Alex tries to spend lots of time with the kid, although athletes have no time to spare. I believe he would make an excellent dad.